A secure world without war. Project Ploughshares takes its name and its vision from the ancient biblical vision in the Book of Isaiah in which the material and human wealth consumed by military preparations are transformed into resources for human development, thereby removing the roots of war itself. Project Ploughshares was established as an operating division of The Canadian Council of Churches to give practical expression to the fulfillment of God’s call to bear witness to peace, reconciliation and non-violence and to contribute to the building of a national and international order that will serve the goals of peace with justice, freedom and security for all. The President of The Canadian Council of Churches, the Rev. 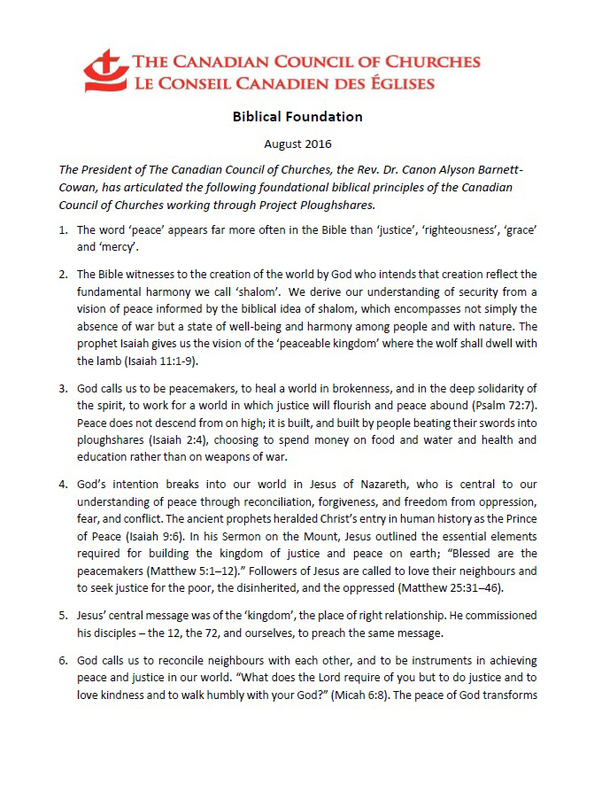 Dr. Canon Alyson Barnett-Cowan, has articulated the following foundational biblical principles of the Canadian Council of Churches working through Project Ploughshares. The word ‘peace’ appears far more often in the Bible than ‘justice’, ‘righteousness’, ‘grace’ and ‘mercy’. The Bible witnesses to the creation of the world by God who intends that creation reflect the fundamental harmony we call ‘shalom’. We derive our understanding of security from a vision of peace informed by the biblical idea of shalom, which encompasses not simply the absence of war but a state of well-being and harmony among people and with nature. The prophet Isaiah gives us the vision of the ‘peaceable kingdom’ where the wolf shall dwell with the lamb (Isaiah 11:1-9). God calls us to be peacemakers, to heal a world in brokenness, and in the deep solidarity of the spirit, to work for a world in which justice will flourish and peace abound (Psalm 72:7). Peace does not descend from on high; it is built, and built by people beating their swords into ploughshares (Isaiah 2:4), choosing to spend money on food and water and health and education rather than on weapons of war. God’s intention breaks into our world in Jesus of Nazareth, who is central to our understanding of peace through reconciliation, forgiveness, and freedom from oppression, fear, and conflict. The ancient prophets heralded Christ’s entry in human history as the Prince of Peace (Isaiah 9:6). In his Sermon on the Mount, Jesus outlined the essential elements required for building the kingdom of justice and peace on earth; “Blessed are the peacemakers (Matthew 5:1–12).” Followers of Jesus are called to love their neighbours and to seek justice for the poor, the disinherited, and the oppressed (Matthew 25:31–46). Jesus’ central message was of the ‘kingdom’, the place of right relationship. He commissioned his disciples – the 12, the 72, and ourselves, to preach the same message. God calls us to reconcile neighbours with each other, and to be instruments in achieving peace and justice in our world. “What does the Lord require of you but to do justice and to love kindness and to walk humbly with your God?” (Micah 6:8). The peace of God transforms our attitude towards life and thus we seek to witness to the peace and justice we have with God. In partnership with God and creation and through the power of the Holy Spirit the Church is called to act out God’s peacemaking in worship, reflection, education, and action. Shalom is a vision of action, and it demands our commitment to faithful response. When the writer of 1 Peter called on the early church to “seek peace and pursue it” (1 Peter 3:11), he was emphasizing there is a requirement for the pursuit of peace. Peace and justice are not just things we yearn for. We have to build right relationships in the concrete realities of our present moment. The prophets of what are commonly called the ‘Old Testament’ – Hebrew Scriptures shared by both Jews and Christians, and to some extent also by Muslims – always had specific messages for the rulers of their day. Indeed, several prophets denounced those who simply worshipped God and did not obey God’s commandment to seek justice and peace in their own time and context (Isaiah 1:11-17). A holistic approach to security for people and nature asserts the indivisibility of development, environment, human rights, democracy, and peace, and accords with the Christian understanding that “peace, justice, and the integrity of creation” are all essential elements of a sustainable society. Our religion requires us to proclaim this and to act on it, thus sharing the vision with the wider society. The foundation and inspiration of our work in peacebuilding is the reconciling and renewing life, death, and resurrection of Christ and Christ’s moral teaching. The witness of Christ demonstrates that all people draw life from a single source and are members of one global community. Christ’s teaching demands that evil in human society be overcome with good and that justice and peace be built by means of love and nonviolent action. “God shall judge between the nations, and shall decide for many peoples; and they shall beat their swords into ploughshares, and spears into pruning hooks; nation shall not lift up sword against nation; neither shall they learn war anymore.” (Isaiah 2:4) This is not just a vision. It is a commandment, and it is an activity which the 25 member churches of the Canadian Council of Churches have pledges themselves to do together, through Project Ploughshares acting on their behalf in fulfilment of the mandate of the Gospel of Jesus Christ.